We just got this video up the other day. 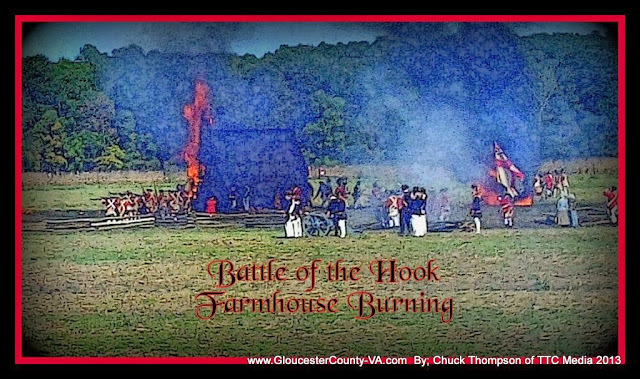 It's the raw footage we shot of the Farmhouse burning at the Battle of the Hook event that took place just a few short weeks ago. The video starts before the farmhouse is burned so you can see the full sequence of events that lead up to the burning and then the video continues on with more of the battle scenes. The video is full High Definition. You can open the video up in full screen to view it. They burned the house down on Sunday, the last day of the event. It was quite a site. Overall, the numbers we got back show that there were a solid 1,500 reenactors that participated in this event and a solid 5,000 spectators over the course of the event. We have other videos we put up as well including a fife and drum video featuring Cold Spring Guard. We still have more to put up as well. Enjoy.